Paul ­Chiang’s spirit is captured in his abstract paintings, and for more than 50 years his determination to follow the artist’s path has never wavered. At Jin­zun on the eastern coast of Tai­tung County, Pacific waves crash against the shore, the horizon welds the sea to a cloudless sky, and Green Island (Lü­dao) is faintly visible in the distance. On this early summer morning, light is already pouring into Paul ­Chiang’s studio. 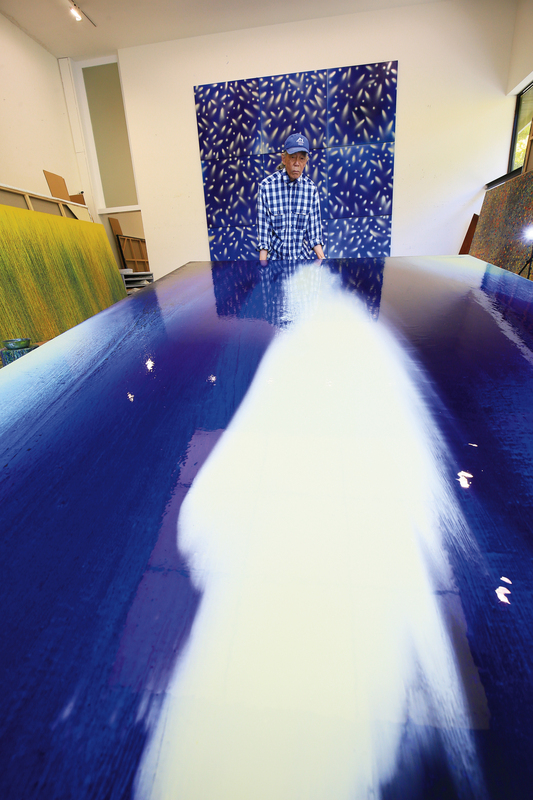 His lean frame clad in his favorite blue-and-white checked shirt, Chiang enters his studio as strains of classical music mix with the splashing of an aerator in a nearby fishpond. On a giant canvas, colors flow from the strokes of his brush. Sunlight, nature, color—these elements rarely appeared in his past half-century of painting, but recently they have become indispensable in his artistic creations. In 2008, he and his wife, Fan Xiang­lan, came to Jin­zun and set up a studio quite different in character from those in other places he has lived, such as Paris and New York. Occasionally they discover the silent traces of unexpected visits by macaques, flowers bloom along garden paths, and they are surrounded by the endless azure of the ocean…. Little by little, it has changed ­Chiang’s work. In the past, he relied mostly on moody hues in black, white, blue and grey. But now he is also employing reds, yellows, and greens. His wife is always the first to see his new paintings, and she was quite amazed by his use of brighter colors. Friends familiar with his paintings tease him that in old age he has finally discovered flowers. The surprise of others is shared by ­Chiang himself. 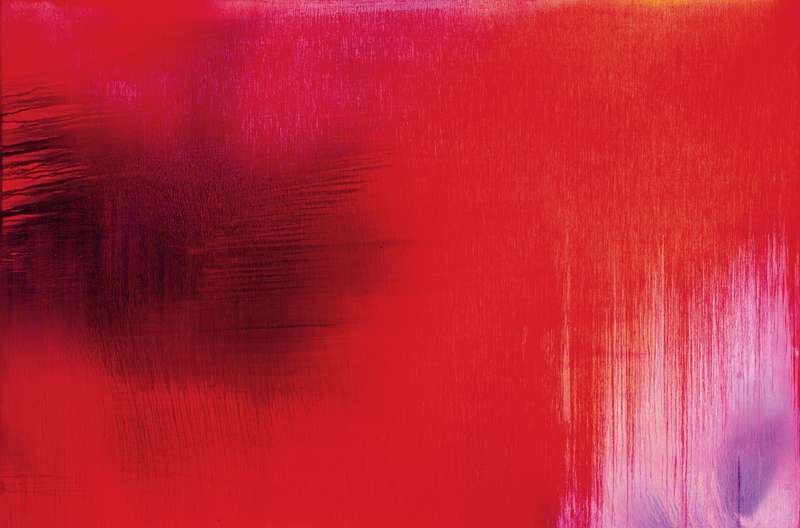 “In my whole career I never thought such colors would appear in my paintings,” he says. What explains such a change? In recent years, ­Chiang’s disposition and bearing have become more carefree and relaxed, and his own explanation is quite simple. “I’m in a completely different environment, I’ve reached a certain age, and the time had come,” he says with a smile. Chiang explains that the sense of solitude present in abstract painting reflects aspects of his own personality. 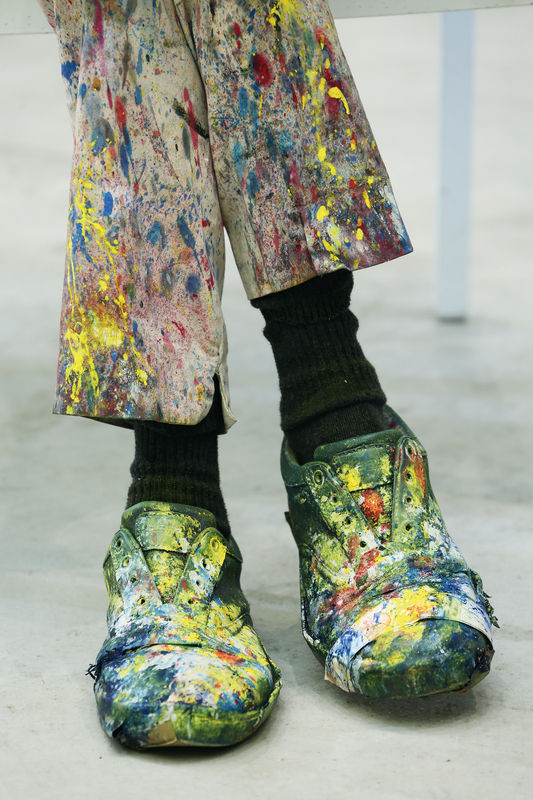 “A work of art is the manifestation of the artist and his life,” he says. Chiang, who was born in Tai­chung, lost his mother at an early age, and his father was often away on business. Sensitive by nature, he lacked the youthful sociability of other youngsters. The temptations of the outside world held little fascination for him, and he devoted his energies to exploring his inner self. When adult relatives caught him daydreaming, the called him a fool. Little did they know that thoughts of the taciturn youth before them were soaring toward lofty realms of abstraction well beyond pedestrian realities. What, after all, is the essence of the abstract? ­Chiang finds an answer in the classical music that he is so fond of. “When listening to Debussy’s Claire de Lune, or Mahler’s Ninth Symphony, words are superfluous: you can feel the spirit of the artist through the music itself,” he says. After graduating from the Department of Fine Arts at Taiwan Provincial Teachers’ College (today’s National Taiwan Normal University), ­Chiang traveled abroad, constantly searching for the essence of art. However, he felt that his brush failed to express the artistic essence that he pursued. Before he painted Notre Dame de Paris, ­Chiang felt that he could not realize his own artistic ideal. His life in those days was full of hardship and doubt, and he often felt the loneliness of failure. After Chiang moved to New York, his painting style began to show minimalist influences. Yet after rising interest during the 1960s and ’70s, enthusiasm for minimalism was already waning in the American art market. At the time his agent, Ivan Karp, looked at his work and didn’t mince words when he warned that Chiang’s artworks weren’t painted in a style that the public would readily appreciate, admire, or collect. But hearing this pointed criticism didn’t cause ­Chiang to waver in his stylistic choices. 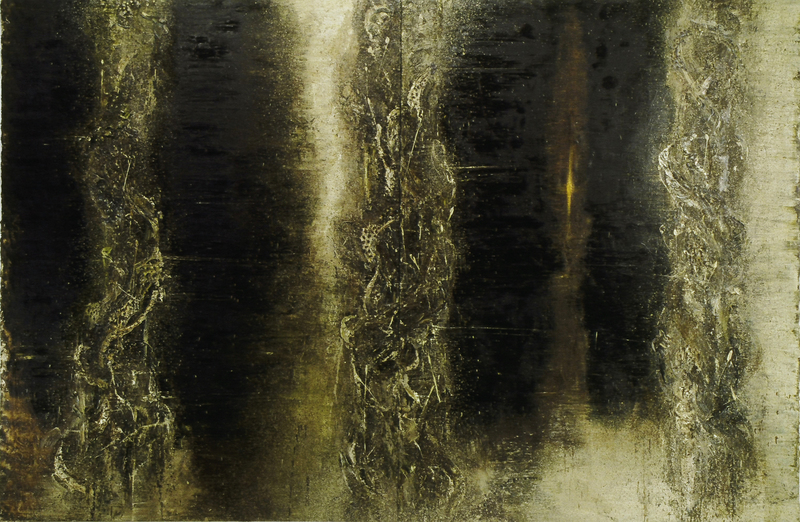 Like a religious seeker for truth in art, ­Chiang persisted along his arduous artistic path. 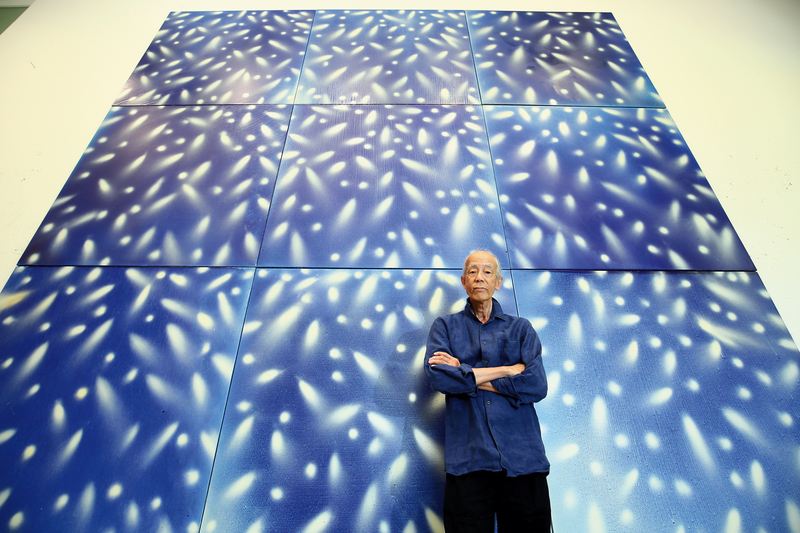 But in his more than 50 years as an artist, ­Chiang has found moments of satisfaction. The painting of the first artworks that lived up to his ideals, his Notre Dame de Paris series, was one such moment. 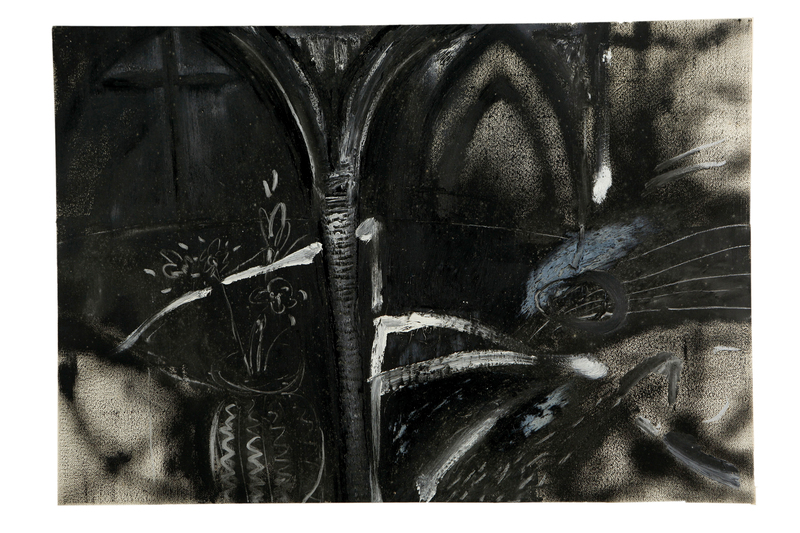 In 1965 he traveled to France in pursuit of his artistic dreams, and in several subsequent visits he discovered that churches could be seen everywhere. These became the places where ­Chiang most loved to linger. Whenever he entered a church, he was moved by the way the light filtered in and the sacred, serene atmo­sphere. In 1982, he rented a loft in the Latin Quarter, covered the windows and worked in the sealed-off space. There ­Chiang painted Notre Dame de Paris, one of his proudest accomplishments, and initiated his unusual creative habit of painting in cloistered rooms. The isolation of his workspace was reflective of his own relationship with the outside world. Later, while living in New York, ­Chiang intentionally cut himself off from other people, save his wife, and lived a life of solitude. The sole thing that ­Chiang allowed into his world of lonely creation was classical music, a companion that had kept him company through the high and low points of his life from his youth and continues to do so to the present. “Music has been my close companion even longer than my wife,” ­Chiang said in 2016 in a short introductory video presentation after being invited to exhibit at Asia University Museum of Modern Art in Tai­chung. While living in Paris and New York, ­Chiang preferred the strains of Bach and Mahler, but after moving to Tai­tung he found that the brisk, cheerful music of Felix Mendelssohn better suited his more carefree temperament. Music, that boon companion, had been percolating in his mind for many years, and more recently it has become a more prominent theme in his art. Three years after moving to Tai­tung, ­Chiang was inspired by Mendelssohn’s On Wings of Song to paint a work of the same title. 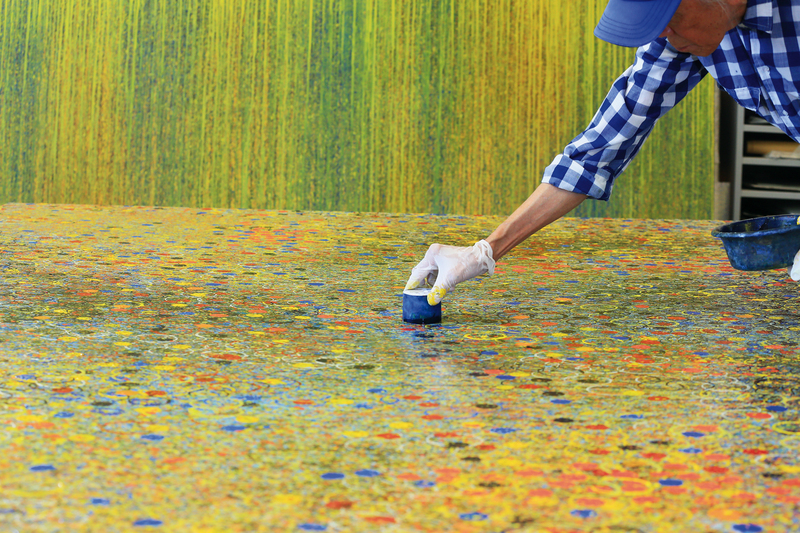 He created the painting by pressing the caps of paint tubes to apply various colors in layers of circles both large and small. 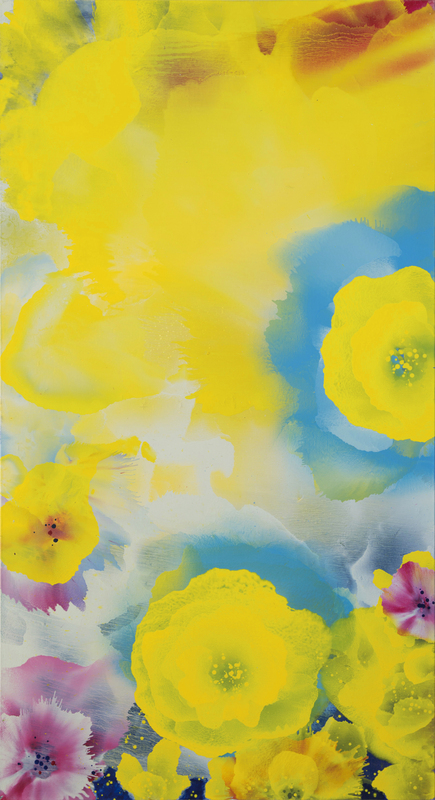 Aside from On Wings of Song, ­Chiang has created other paintings inspired by classical music, including Salute to Bach (2011) and Debussy (2013). From Notre Dame de Paris, his first truly representative work, to The Hundred Year Temple (1995), Silver Lake (2007), and Pisilian, a series painted while he lived in Tai­tung, ­Chiang has produced a new series of paintings every five or six years. Without being told, ­Chiang can sense when he has become too familiar with an environment and a set of techniques. Thus he has continued to relocate his studio throughout his career and to leave behind surroundings that have become too familiar, in order to have new experiences. “Relying on familiar techniques is not a good thing for an artist,” ­Chiang says. For example, The Hundred Year Temple, which ­Chiang considers an important work, was inspired by a visit to Tai­pei’s Long­shan Temple after ­­Chiang returned to Taiwan in 1995 to visit his ailing father. While burning incense at the temple, he became fascinated by the devout worshipers and the curling incense smoke that filled the building. This scene became his inspiration for the painting. The temple’s dragon columns, flickering candles, and burning incense were represented in their tranquil opaque radiance in the painting. 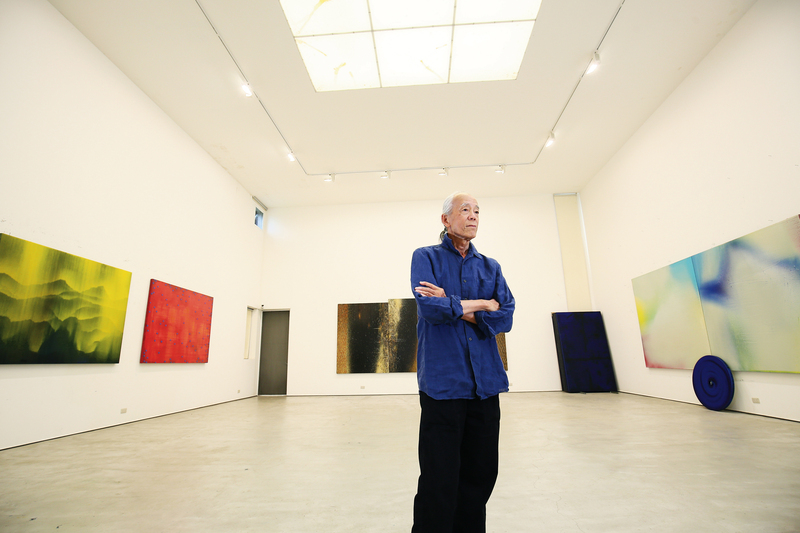 After a career spanning more than a half-century, ­Chiang, now in his seventies, is still busily pursuing his art. Working from dawn until dusk, he is still attempting to realize his artistic vision. Chiang is planning to expand his studio at Jin­zun to make a park covering nearly five acres. It will include a gallery to display his artwork and a garden gallery that will provide a home for his sculptures. 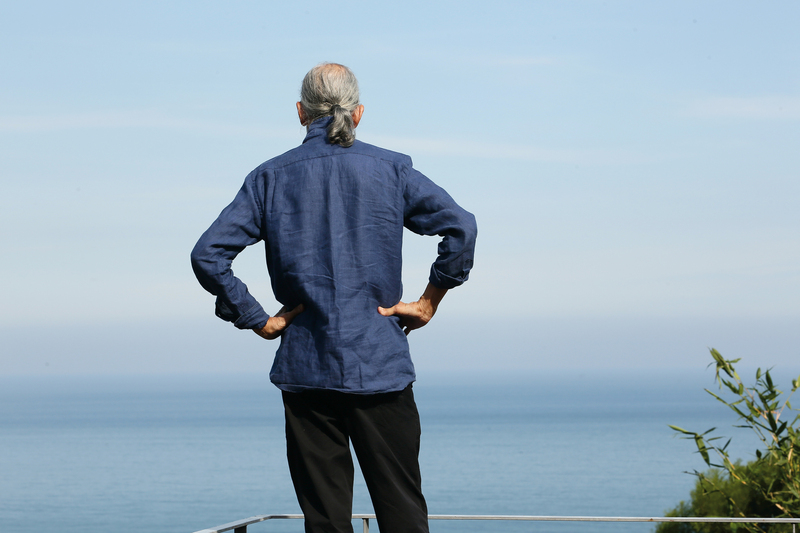 As we stand on the roof of his studio, the Pacific breeze dispels the heat of a summer afternoon. ­Chiang’s artistic dreams have come full circle from Paris back to Taiwan and found a permanent home on the Tai­tung coast. Still slender after all these years, ­Chiang gazes into the distance, a smile floating gently across his face.